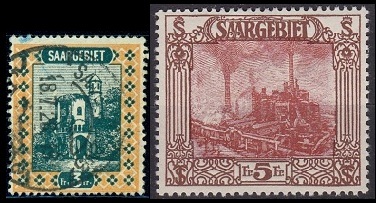 During 1922, the Saar Plebiscite Territory, "Saargebiet" or "Saar Occupation" in German, issued a new series of definitive postage stamps, based on the 1921 pictorial definitive issue designs. The new stamps were all denominated in Centimes and in Francs. The new pictorial definitive postage stamps issued in 1922 are all shown above (Mi. #86-97, Sc. #99 // 116). 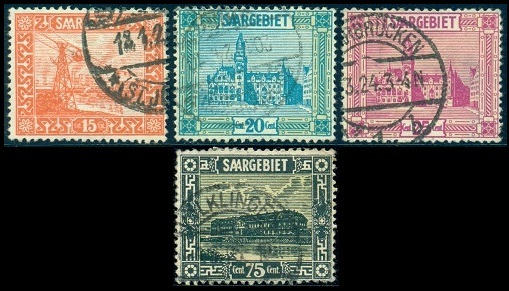 They incorporate the same subjects used for the 1921 issues, but the stamps are a little bit larger, the depictions are clearer, and the colors are brighter than those used for the previous printings. Many of the new stamps in this issue are even bi-colored. For the specialist, there are many plate varieties, as well as imperforates, for almost all of these stamps. See the Michel Deutschland Spezial Katalog volume 1 for details. During 1923, the 15 C., 20 C., 25 C., and 75 C. denominations were re-issued with changed colors. They are all shown in the image above (Mi. #98-101, Sc. #103 // 112). There are also many plate varieties known for these issues, as well. The 45 Centime and 10 Franc stamps shown above (Mi. #102-03, Sc. 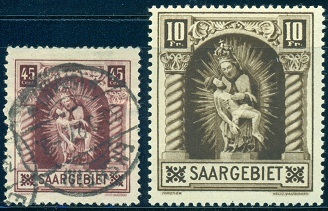 #118-19) were issued in the Saar Plebiscite Territory on April 9, 1925, and they both depict the Madonna of Blieskastel. 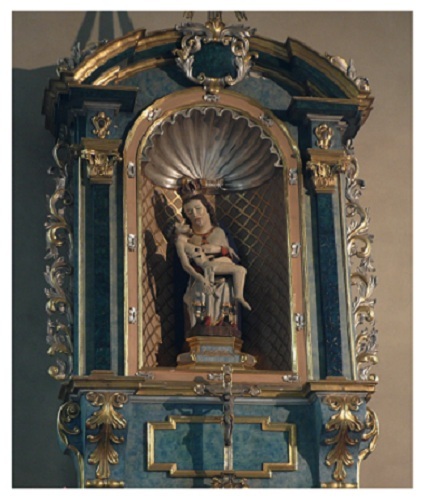 The 14th Century oak Pietà, known as the Madonna of Blieskastel and as Our Lady of the Arrows, is shown in the photograph above. The statue is believed to have originally been in the possession of a monk in Bebelsheim. It is said that marauding soldiers, attacking the monk, shot arrows into the sculpture, causing it to bleed from its wounds. Countess Elizabeth of Blieskastel, who suffered from an eye disease, put the blood from the sculpture's wounds on her eyes, and her disease was miraculously cured. Countess Elizabeth, out of her gratitude, placed the sculpture in a monastery near Letschenbachtal. The monastery was dissolved in the 1780's, and the sculpture was subsequently forgotten. The Pietà was re-discovered in 1911. It was authenticated and restored in 1914, and then, by the order of the Pope, it was placed in a Capuchin chapel in 1924. Today, it is located in the Holy Cross Monastery Chapel in Blieskastel (Saar) Germany.